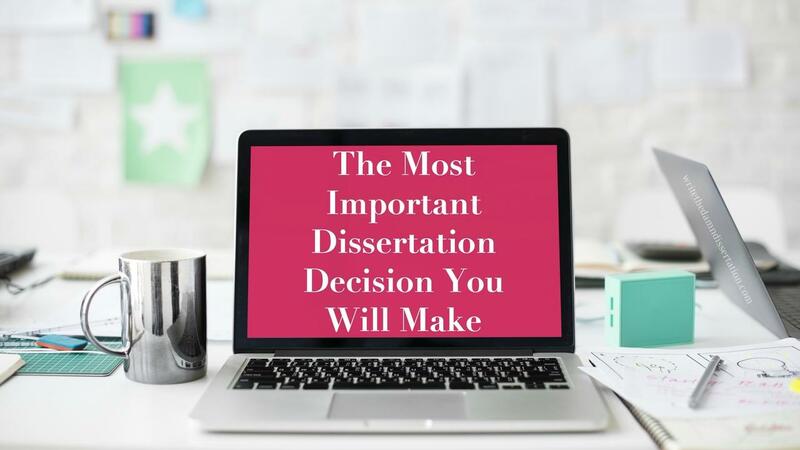 While both decisions are important, the single most important research you will do as a doctoral student will be in selecting your chair/advisor. With the right chair/advisor, you can make steady progress, completing your dissertation on time and graduate on schedule. With the wrong advisor, you will spend time in the abyss known as the "drift", fail to make progress, and face the risk of ultimately not finishing, and becoming a Ph.D.W.D (Doctor of Philosophy Without Dissertation) or an Ed.D.A.B.D (Doctor of Education All But Dissertation). Your chair alone will determine when and if you are ready to move to the next step at any point in the process. Talk to former doc students in your graduate school. 1. Would you recommend your chair to current dissertation students? Why / why not? 2. How long did it take for your chair to provide feedback to you? (The key here is 3 weeks at MOST.) If it takes longer than 3 weeks, move on. You want someone who will be there to provide timely feedback. When you approach a potential advisor, be prepared to discuss your timeline. Assure your potential advisory that the timeline is not more important than the quality of research. Explaining why you want to have a short timeline can help put things into perspective. If you are not strong and confident in statistical analysis and quantitative methodology, consider finding a chair who is a professor of statistics/research methods. Committee members and examiners in the final defense will be less likely to question any parts of the results or research designs. Have you chosen your dissertation chair yet? If so, what why did you choose them?